The Harold J. Berman Papers, a collection of professional and personal papers from the life of Emory University's first Robert W. Woodruff Professor, is now open for research at Emory's Hugh F. MacMillan Law Library. 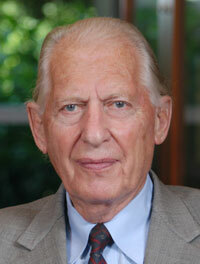 Berman is considered to be the father of the modern study of the law and religion field. He died in 2007.
e up of correspondence which includes letters to and from scholars, jurists, government officials, students, friends, and family. Prominent correspondents include: Jimmy Carter, Erwin Griswold, John T. Noonan, Jr., and Eugen Rosenstock-Huessy. is work as a writer, lecturer, and consultant; and his intellectual development as an historian. hotographs. An online exhibition features a digital finding aid as well as several letters from Berman's professional and personal papers. The selected correspondence highlights aspects of his career and personal life. The bulk of the collection, however, remains in its original print form in the archives room on the first floor of the library. A full online collection of Berman's published and unpublished non-book writings is available via Zotero. It can be accessed here.